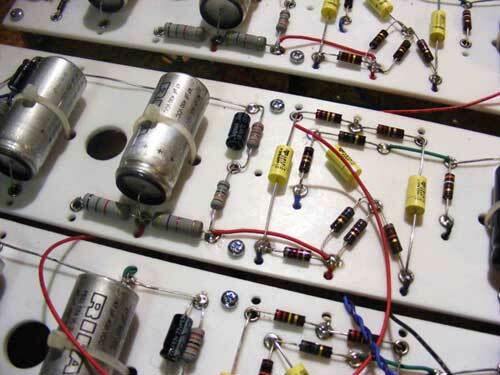 JPF Amplification are proud to present three new guitar amplifiers hand-wired in England. You can see and hear our fantastic amps in action by visiting our Media page. 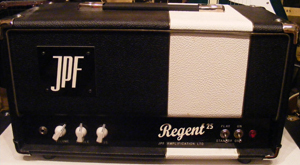 The Regent 25 employs the same basic topology as the other amps in the JPF range but is powered by two Gold Lion Reissue KT66s, to give 25W before the onset of clipping. Currently available as a head , 2 x 10″ or 2 x 12″ combination amplifier format. The Sir Charles 15 is designed around a pair of 6V6 output valves. 6V6s were extensively employed in the lower powered classic American amps that kick started Rock ‘n’ Roll. The simple ergonomics – just volume, treble and bass controls – and 15W of power at the onset of clipping, make this an ideal gigging amp, allowing you to get power valve distortion without being told to turn down by the soundman! Click here for the Guitar and Bass magazine review of the Sir Charles 15 combination amplifier. The King Charles 30 employs the same pre-amp topology as the Sir Charles 15, but has EL34 valves in its output stage to provide a gnat’s under 30W of power before clipping. EL34s are the power valves that helped define the “British sound” and are used in Marshall, Hiwatt, Selmer and many Vox amps. 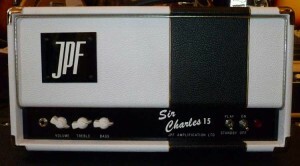 More head room than the Sir Charles 15, the King Charles is voiced to enhance the “chimey” qualities of the EL34, and like the Sir Charles 15 transfers smoothly from clean to overdrive. JPF’s Amplifiers have been created with the guitarist in mind. Our inspiration draws our experiences repairing vintage amps at Angel Music, one of Denmark Street’s leading high-quality guitar sellers. We took the opportunity to learn from a broad range of guitarists, from weekend warriors to stadium stars, what they truly want from their amps. Using years of expertise in the fields of broadcast technology and research, our design process has involved hours of painstaking R&D which includes extensive feedback from guitarists and music producers, real innovation, attention to detail, many hours of listening tests, and over 10,000 cups of tea! Rather than rehash existing designs, JPF have developed a unique combination of the classic circuit elements used in vintage valve amps of the 50s, including: Selmer, Gibson, Vox, Gretsch/Valco (!?) and Fender. The philosophy behind these amps was to design a simple circuit that incorporates the best characteristics of classic valve amps, but with the hindsight of an extra 30 years of technological advances since these classic valve amps were manufactured. Thus we’ve used the best modern materials and construction techniques (e.g. PTFE circuit card, toroidal mains transformers, star grounding etc) combined with elements that gave the classic amps their sound (e.g. carbon composition resitors and valves (!)). The small-box head format and use of lightweight materials means these amps really are portable, whilst our 1 x12″ combo is still very manageable. OK, OK, the 2 x12″ is a bit weighty, but that goes with the territory. All our amps have been extensively road tested during the design stages, and have passed with flying colours. We are so confident that our amps won’t let you down, that all our amps come with a 5-year transferable warranty. The unpleasant tonal artefacts and high levels of noise that many vintage, and even contemporary, amps suffer from have been painstakingly engineered out of our amps. The low noise circuitry and quality of tone allow recording engineers to place microphones without compromise rather than fighting noise, rattle and hum. 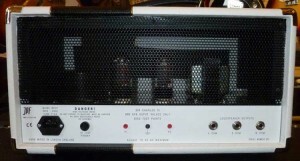 Hand wired by JPF Amplification in London, England. Custom UK-made, 2 mm aluminium chassis for light weight and low noise. 3 mm Teflon circuit card, CNC machined in house with components mounted using eyelets. Epoxy potted toroidal mains transformer wound in England by Tiger Toroids to JPF specification. Paper-interleaved output transformer custom wound by Majestic Transformer Co.
Every component selected for optimal sonic performance and reliability, including: metal film, metal oxide and carbon composition resistors, silvered mica and polyester film caps, CTS pots, 105°C elctrolytic capacitors, and Switchcraft jack sockets. 4, 8 and 16 ohm speaker outputs on our amp heads allow easy matching to virtually any cabinet. Our combos have out speaker outputs for either using the internal speakers, or internal speaker + extension cabinet. Low noise floor due to optimal grounding, circuit layout and lead-dress. External output valve bias test points and adjustment. Environmentally friendly construction including the use of lead-free solder – all JPF amps conform to the latest environmental standards. 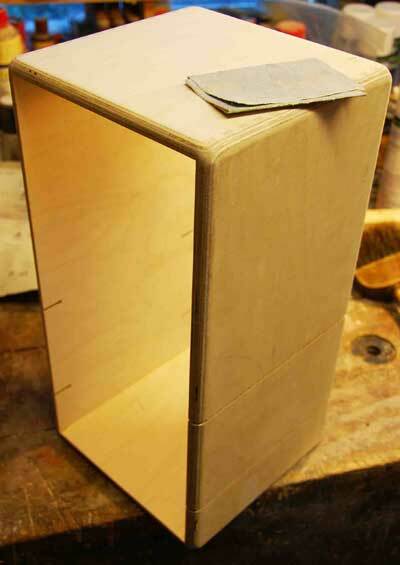 Light-weight finger jointed birch plywood head shells, and birch ply combo cabinets. 5-year transferable parts and labour guarantee (excluding valves). Your choice of coloured coverings at no extra cost including Go Faster Stripe for improved tone! Audio recordings done by Joe using an off-axis SM57 and AT4040 for a little ambience, recorded via an RME Fireface. Guitar played by Dave Page of Headspace.